Cookies for breakfast? Yes!!! Try this Peanut Butter Banana Breakfast Cookies Recipe! They are perfect any time of day and can be made gluten free! I walked into the kitchen earlier and saw this…. Why is it that my kids eat bananas in spurts. One week I can’t buy enough and the next they look like this. I was bound and determined to makes something with them, but not muffins. Since my kids just got out of school for the summer, I like to throw fun surprises at them. So when I said we were making cookies for breakfast, I got squeals of delight! They thought I had gone crazy baking them cookies for breakfast, but little did they know that they are actually really healthy! Check out these really easy Peanut Butter Banana Breakfast Cookies! You and your kids will love them. Plus, they are Gluten free, dairy free, and egg free! I love it when I can do that! Cookies for breakfast? Yes!!! Try this Peanut Butter Banana Breakfast Cookies Recipe! They are perfect anytime of day and can be made gluten free! Mix bananas, peanut butter, canola oil and brown sugar together until relatively smooth. Add vanilla and mix until combined. In a separate bowl, combine oats, flour, baking powder, baking soda and salt. Slowly mix oat mixture into banana mixture until everything is combined. Place spoonfuls of dough on cookie sheet and bake for approximately 10 – 12 minutes. **Gluten Free** Use a gluten free flour mix and gluten free oats. Store in an airtight container…if they last that long. These are great to make in advance and freeze for busy weeks too! this looks really good and I can’t wait to try it. I am going to use agave nectar instead of the brown sugar. Excellent idea, I always have those ingredients in the pantry! I wonder if I could use the Splenda brown sugar blend instead….I’m willing to try. I hate throwing bananas away. Thanks! Splenda is not a healthy ingredient. try an unrefined sugar if it must be sugar. coconut sugar might be better too. Danielle, how much apple sauce did you use to substitute the 1/3 cup of oil? I have all the ingredients in my kitchen except for the canola oil. I can’t wait to make these cookies!! Looks so yummy! Do you happen to know how many per serving and calories? The recipe makes roughly 4 dozen cookies. And I am sorry I do not know the calorie count on these. Thank you so much for this recipe! I had all the ingredients and thought I’d try making it. It sounded like a good grab-and-go breakfast item for my kids for what’s left of the school year and for whatever early-in-the-day summer activity. Because it’s a healthy recipe, I thought they would stay away from it. I had my 16-year old son and 3-year old daughter make it so that he would know what’s in it, not that she cared. We couldn’t agree on what he should use to scoop it so he had an idea to just lay the whole batter onto the sheet (I used the one with the 1-inch high sides). I then realized that we could actually make it into breakfast bars instead. I did have to cook it longer, I just can’t tell you by how much since I kept adding 5 minutes to the original cooking time until it turned golden brown and it was no longer soft and gooey in the middle. Maybe an extra 15-20 minutes? It was wonderful and while it was meant to be eaten in the morning, everyone wanted to try it after dinner. I had to stop them from finishing the whole thing tonight! Guess what’s for breakfast tomorrow? Thanks again! I made these this morning. I substituted 4 Tbs. milled flax seed and water and 2 Tbs. Canola oil for the original 1/3 cup of canola oil. I also used 1/2 C. succanat instead of the sugar. YUM! Thank you so much for the recipe. Yes, I could taste the banana in these. 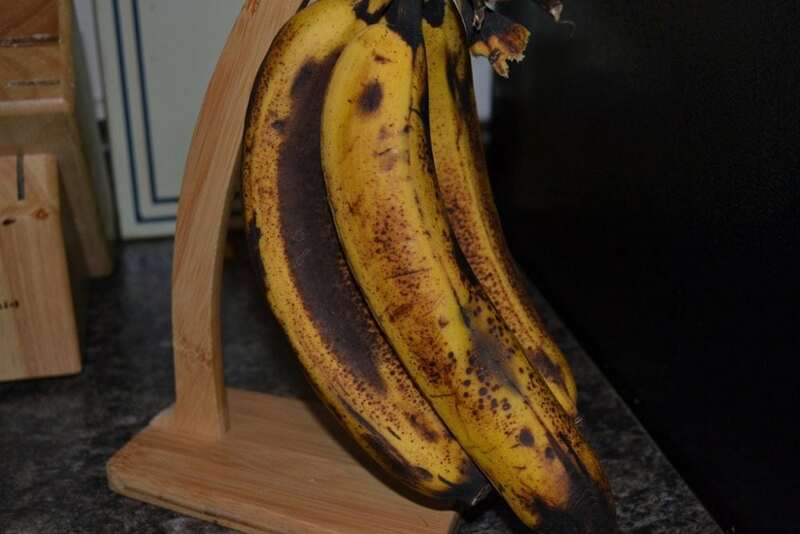 The bananas I used weren’t even as brown as those in the photo. I like bananas, but these are definitely BANANA Peanut Butter Breakfast Cookies (I couldn’t taste the peanut butter in the baked cookies). These do seem like a healthy breakfast sweet. Thanks, Amanda, for the recipe! Thanks so much for the recipe. My hubby and I just ate 4 cookies each and it is 9-30 p.m. The cookies are soooo good. This recipe is Yummmmmmy! Added toasted pecans and chopped milk chocolate chips! So delicious!!! Thank you! I knew a family that their son had to have gluten free everything and you actually have to use special baking powder. Just thought I would let you know before someone made them for a celiac afflicted person and they got sick. I’m a Daycare provider and I made them with my kids this morning they loved making them and eating cookies for breakfast! I used applesauce instead of oil, coconut flour, coconut sugar, dark chocolate chips, a dash of cinnamon and steal cut oats. Not only are they healthy but super delicious. Thank you for this recipe! Cookies for breakfast!!! I am making these!! I made these yesterday and we enjoyed them for breakfast. Absolutely delicious!!!!! I love this recipe but mine keep ending up very very crumbly. Are they supposed to be this way? These were so good! I made them with coconut oil, and they were fabulous. I also added about a tablespoon of cocoa powder and decreased the sugar to 1/2 cup. The whole family loved them!! I added some flax seed and these were delicious. I actually ate some spoonfuls before putting them in the oven. Yummy! A new favorite for sure! this might be a silly question, but could I substitute crunchy peanut butter without it messing it up? That’s all we ever have on hand.. I’d love to try them but didn’t want to ruin the whole recipe! I will have to substitute almond oil for the canola/coconut oil as i cant have either of them. Also had to substitute maple sugar for the brown sugar. Added flax & chia seeds, cinamon & some dark chocolate chips. Made them into breakfast bars so I didnt have to mess around with a scoop. Wrapped each bar in a little parchment paper package after baking for easy transport.